Air pollution affects all regions of the world. However, the populations in low-income cities are the most affected. According to the latest database of air quality , published by the World Health Organization (WHO), 97% of the cities in low and middle-income countries with more than 100 thousand inhabitants do not meet the air quality guidelines. In 2016, indoor and outdoor air pollution caused some 7 million deaths, that is, one in every eight deaths worldwide. Today, indoor air quality and pollutants are recognized as a potential source of health risks. There is consistent evidence that exposure to domestic air pollution can lead to acute respiratory infections in children under five years-old, as well as ischemic heart disease, stroke, chronic obstructive pulmonary disease and lung cancer in adults. According to the WHO in 2016, household air pollution caused 3.8 million deaths . 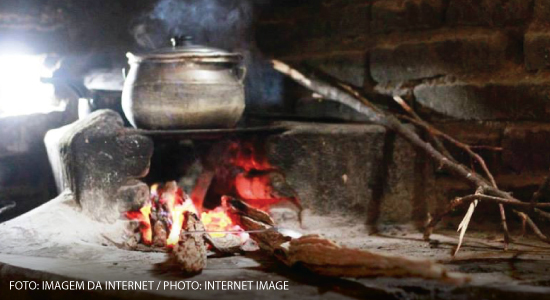 Globally, more than 40% of the population depends on polluting fuels for cooking. These materials, including biomass fuels (wood, manure, agricultural residues), kerosene and charcoal are burned in stoves, which have low ventilation not allowing complete combustion of the particles. Cooking and heating with polluting fuels in fires or traditional stoves results in high levels of household air pollution. The indoor smoke contains a number of pollutants harmful to health, as small particles and carbon monoxide; particulate pollution levels can be 20 times higher than the values admitted in the guidelines. Women are the main victims of this exposure because they spend more time indoors. In India, for example, about 83% of rural households and almost 20% of urban households use solid biomass fuels for cooking. In addition, cooking requires long hours, using many oils for frying, producing vapors that are inhaled, affecting the health of these women. Children, on the other hand, are part of the most vulnerable group to indoor air pollution since they have a higher resting metabolic rate, as well as a higher rate of oxygen consumption per weight than adults. Air pollution in indoor environments weakens their lungs and reduces immunity, making children more susceptible to airborne infectious diseases, such as cold and flu. Indoor air pollution also affects the development of childrens’ endocrine glands and nervous and immune systems, as well as academic performance, caused by school absences due to diseases such as allergy and asthma and decreased concentration levels. Dubbed “the killer in the kitchen,” domestic air pollution is considered the leading environmental cause of death and disability. The problem of smoke from burning coal and sticks is so big that it kills more people than HIV, tuberculosis and malaria combined. In addition, it involves the issue of global warming, which has caused climate change, as excessive rains and landslides killing many Rwandans in recent years. 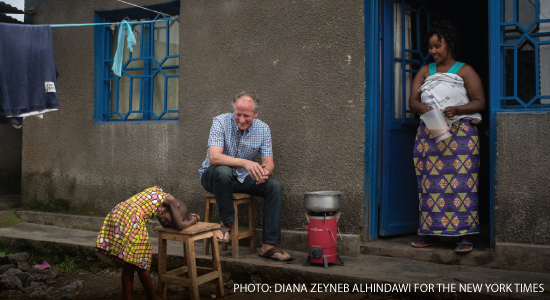 Concerned about this sad reality, Eric Reynolds, founded Inyenyeri, a company specialized in stoves in rural Rwanda, aiming to assist the poorest people in the world and to contain the deforestation in the region, saving millions of lives. In a recent article published in “The New York Times“, Eric Reynolds, reveals that he is about to release most of humanity from the deadly scourge of smoke caused by kitchen fire, protect what remains of the forest on the continent and also help save the planet from climate change. “It is shameful that we have three billion people still cooking as in the stone age”, adding that this is a totally solvable issue. “The vast majority of people, especially those who live in rural areas of Rwanda, cook with charcoal or sticks. These people spend about three hours a day collecting fuel or spend a considerable part of their income buying charcoal. Cooking this way puts people in contact with the toxic fumes”, he points out. Unhappy with the situation and searching a solution, Reynolds tested stoves made in Italy, in India, in the United States and in China. He experimented making charcoal from corn cobs, tried to burn banana leaves, until he discovered the pellets used as fuel, which are less polluting than wood or charcoal, and reduced by up to 90% the consumption of raw vegetal material. After many attempts, he used a Dutch-manufactured stove, that burns wood releasing clean gases and, with the use of pellets, reduced the need to use wood by up to 90% if compared to charcoal. However, these stoves cost over $75. That’s when he came up with the idea that Inyenyeri could provide the stoves free of cost as people would need to buy the pellets from them, which are 30 to 50% cheaper than charcoal. “The business would be selling fuel every day rather than selling a stove every couple of years”, says Reynolds. Still according to him, the secret is not the stove or the fuel, but a balanced combination of the two. Currently, Inyenyeri has distribution offices in towns and villages in Rwanda, including one in a refugee. It operates a small-scale pellet factory in Gisenyi, a town by Lake Kivu, and is developing a larger factory. According to the report in the New York Times, the company has developed its own customer management software to track pellet purchases, consumption habits and several other data, with real-time updates by people using a mobile app. The data attracted research institutions, including the National Institute of Health, Johns Hopkins University and the University of North Carolina. They have performed studies probing how the clean cooking technology affects public health and how families free of wood collection use their extra time. The so-called clean stoves have been singled out as a solution, especially by the Global Alliance for Clean Stoves (https://cleancookstoves.org/), a coalition launched by Hillary Clinton in 2010. Clinton said stoves “could be as transformers as mosquito nets or vaccines”, which have saved millions of lives. Clean stoves “can save lives, improve livelihoods, empower women and protect the environment”, said Global Alliance. In recent years, researchers have learned a lot about how exposure to indoor pollutants contribute to diseases. Researchers funded by the National Institute of Health (NIH) are looking for ways to reduce the damage caused by indoor air pollution. The studies include questions such as: what should we do about it? What could help reducing some of these exposures? 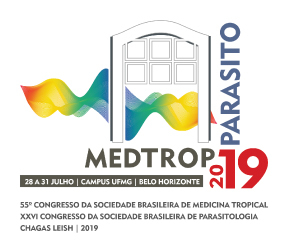 In the article“Global actions aim to reduce problems of indoor pollution”, published in 2014, Dr. Carlos Costa, who is the general coordinator of the Brazilian Society of Tropical Medicine’s Media service has already called attention for the matter. 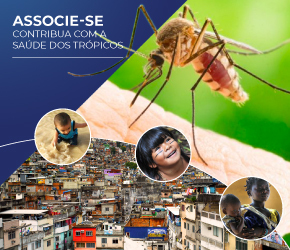 “This is one of the new themes that Tropical Medicine must be involved, because it occurs mainly in the binomial that defines the Tropics: climate and poverty. Since its main theme is the health of tropical peoples, Tropical Medicine should include these items in its the scope of the damages discussed in their conferences and newsletter. Still according to him, social media has been an important ally in this process, once an increasing number of people access the contempt, data and discussions about the theme, giving people the ability to be concerned about the matter and now have means to debate it in public. However, he alerts: “indoor pollution is not only a tropical problem, it is a global threat. In fact, the use of clean stoves is the simplest and most immediate way to act against the threatening global health”, he ends.